One of the singular features of this site is the presence of around one hundred (!!) carved antler bracelets, and inferred goat horn bracelets as well. Remarkable. So fine tools would be needed for these decorative items. And for carving, you know, wood, as well. The item above, which is leftmost in the top picture, is the one I have an analogue for. 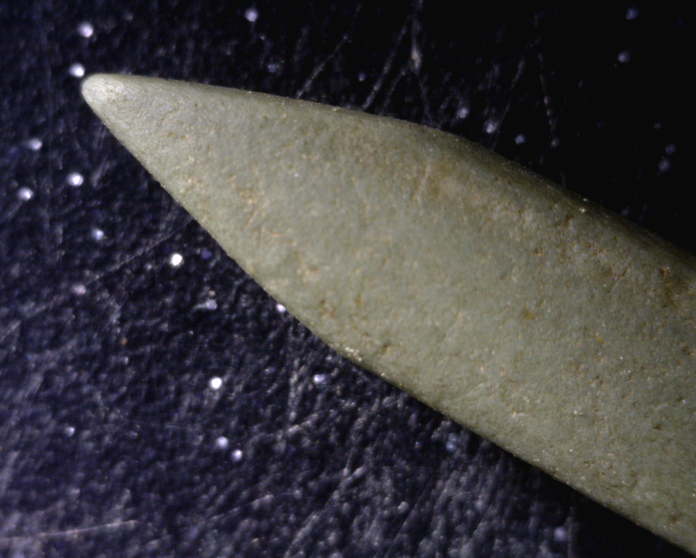 Another new artifact type from the Kaien Siding project is what we have called the miniature stone chisel. 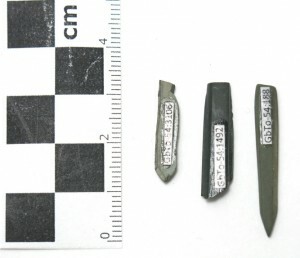 Three exceptionally small, finely finished green stone and possibly basalt chisels were recovered from GbTo-54. 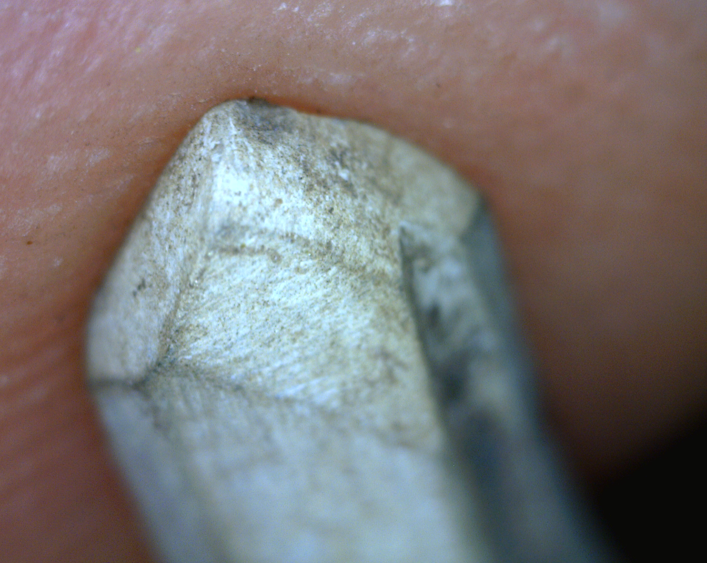 These are highly polished on all surfaces and taper toward the distal tip (see below). All were made by incising or sawing along the long edges to groove then snap the stone, and then the point was made by grinding facets. GbTo-54:188 is complete. They must have been hafted into handles to allow fine manipulation as they are much too small to hand-hold. Functionally, they would have served to carve fine lines or relief in detailed work; perhaps some of the 100 antler bracelets or the inferred goat horn bracelets at these sites. The working tip of :188 is less than 1 mm wide, and much thinner. To our knowledge, no other comparable artifacts have been noted for any Northwest Coast assemblage. The rightmost of the tools is more enigmatic. In plan view apparently it has a straight (chisel-like?) working edge only a millimetre or so wide, while from the side it clearly tapers to a point like a pencil. A delicately groovey tool, for sure. And from the picture, not showing use-wear like, say, a drill. (The post by Millennia immediately got me wondering again about bead manufacture on the NW Coast, as we covered here and here). 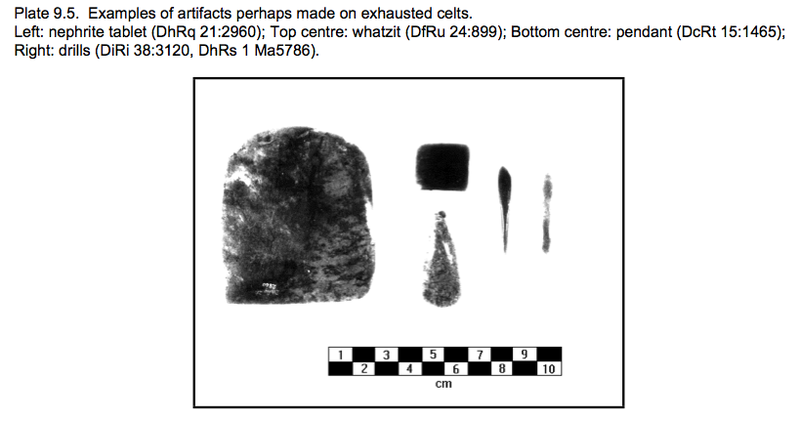 I don’t have a really good analogue for these, but turning the clock back a little, the picture below from my MA thesis shows two nephrite (probably, hi Jesse) “drills” which if memory serves were kind of enigmatic and pointy. Small nephrite “drills” on the right. Source: Mackie MA thesis. (The picture is sort of crap because, among other things, it was done in the old days where you had to balance the exposure for all the artifacts at once against a lit background onto film which you then developed and dodged and burned to see what you got the night before your oral defence get off of my lawn, kids). And as you can see, the width on these is also around the magic 4 mm mark. Some of the beads we’ve talked about have sub-millimetre holes drilled in them, so these probably aren’t the tools in question, and drills are usually quite distinctive and definitive in their use wear patterns. But these make a lot of sense for fine engraving of delicately-carved materials like antler and horn, the former being quite tough, the latter probably quite soft. And assuming you use a reasonable screen mesh and water, you aren’t too likely to miss these sizes of tools either, I don’t think. Four millimetres is about 1/6th of an inch – so 1/8th screen should be fine, barely, but 1/4, very risky. Still, enough people use 1/8th inch mesh these days, don’t they? Anyway, if you have any thoughts on these micro-engraving tools then the comments are below, or go over to Millennia’s blog and leave them at the source. 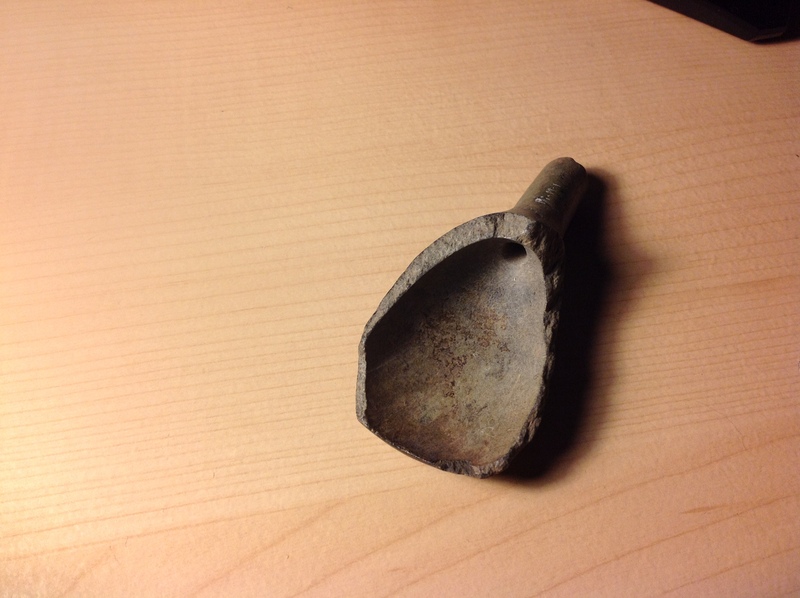 This entry was posted in Archaeology, Northwest Coast, Technology, Uncategorized and tagged antler, drills, engravers, horn, Millennia Research, Prince Rupert, Technology, Tsimshian. Bookmark the permalink. We have stone carving tools at Meier, but they are chipped stone also beaver incisors. If anyone wants to get a sense of the size of objects such tools could have been used on, look at Figure 10.2 in “Chinookan Peoples of the Lower Columbia” edited by Boyd, Ames and Johnson (shameless plug). It’s a tiny carving in the Lower Columbia style. The other thing here is, at GbTo-54, my understanding is Millennia is working on a narrow sliver of midden between the railroad tracks and the water. It would have been all too easy to write this off as a munched-up pile of low-significance, but to their credit, they identified really important intact deposits, including a series of really unusual hearths, and excavated them to a very high standard. It’s really impressive that they have extracted such great information from what superficially must have seemed like a bit of a dead end. No comment on the tools (other than they are cool), but the “… to see what you got the night before your oral defence get off of my lawn, kids” brought a laugh! I might hazard a guess that this site is a very specialized production place for such braclets, and these tools are clearly associated with that activity. If this activity only occured at a few such locations, then these artifacts would be correspondenly rare. This is sort of the same scenario i’ve laid out for bead-making in the Coast Salish world around 4000-3500 BP in your earlier posts. Richard Wisecarver (apt name) – thanks for that. The RRN has numerous examples of engravers with metal tips, many of which have these blunt, multi-faceted tips. It’s almost as if they were used to push material out of a groove or dent it, vs. actually cut through it. Jesse – I like the bead specialization idea in principle but it seems almost like “too easy” a technology to support craft specialization. Perhaps not, but I guess I’d expect a little bit of it everywhere even if there were manufacturing centres in a few places. I’m always impressed by how much we don’t know still. Maybe every shell midden between Quadra Island and Port McNeil is stuffed full of micro-drills – how would we know? But, yes, we don’t think enough about craft specialization on the NW Coast, for sure. Quentin – I’ve posted a bit of this suggestion to their Website but not had a reply so far. 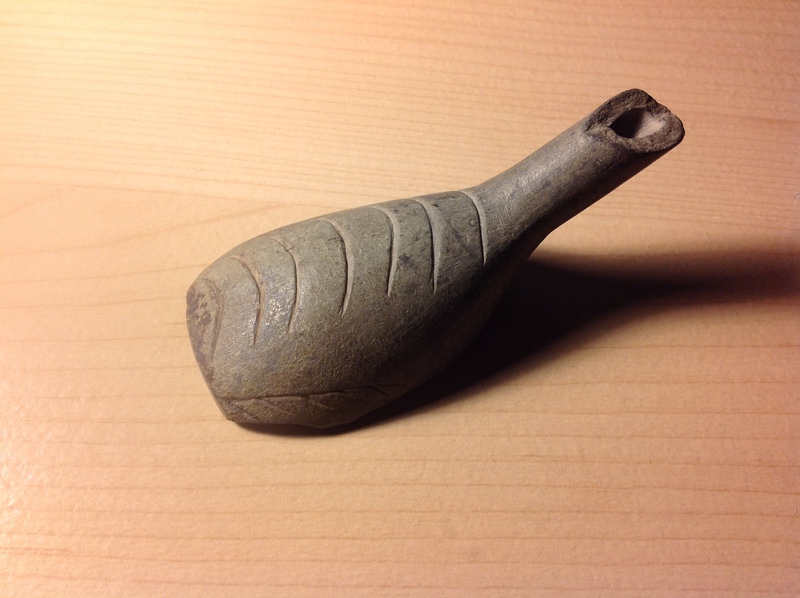 I wonder about the applicability of fine-carving of soapstone types of objects. 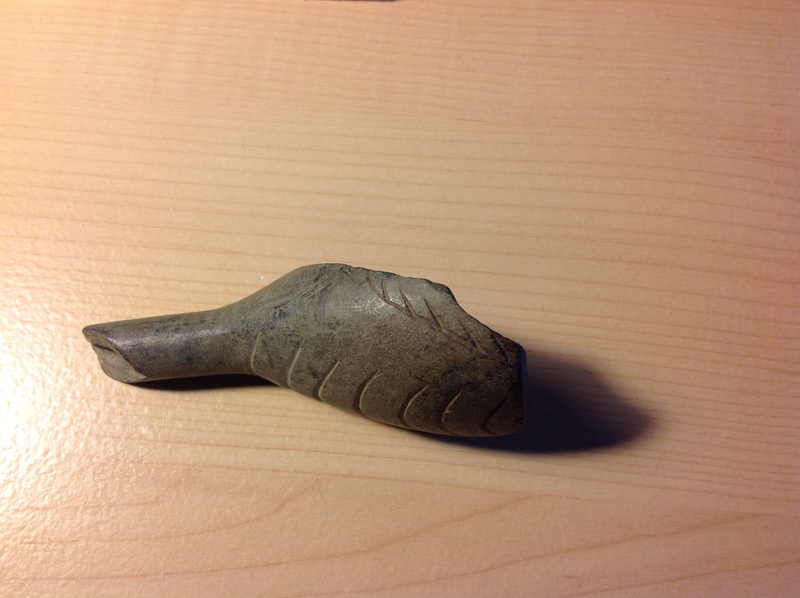 I have a pipe that demonstrates how involved such decorative elements were on such objects — although I have no idea when this particular piece might have been crafted. I can post the images if you let me know how. Mike – I did leave a brief comment earlier but I’ve elaborated today. Though from home I can’t moderate my own comment! Try our Facebook page to leave photos(millennia research). Anyway, Ken Ames can confirm or rebut, but I don’t believe soapstone (steatite) of any kind has been found ever in Prince Rupert Harbour. In that regard it’s quite different to the Fraser/Thompson or Columbia systems where soapstone is sometimes very common. Thanks, Morley — what about carved bone, antler or ivory work? Any indication of same? The odd thing is that such specialized tools indicate a developed tradition of some form of fine carving — but not wood….I’ll check your Website and upload the pics I referred to; amy not have a local application but they’re interesting regardless. Mike, if you want to send me the images qmackie at gmail then I can post them in-line here with the other comments.